Other Regulated Material ORM-A - 3" x 5" on Semi Gloss. 500 per roll. To bring you our best price minimum purchasing requirements may change without notice. Please call for the most up-to-date pricing on this item. ORM-A shipping labels. The abbreviation for Other Regulated Material - Class A. Used in reference to the DOT hazard classification of chemicals whose transportation is regulated by the Hazardous Materials Regulations. An ORM-A material is one whose properties would cause extreme annoyance or discomfort to passengers or crew if it leaked during shipment. Carbon tetrachloride is an example of ORM-A. 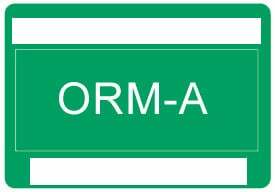 The Other Regulated Material O31 is also known as ORM	O31	.